14. Opening Ceremony All the participants in the openmg ceremony are to meet out side the centre, on the 23.09.98 at 12.15. Two players and one or two coaches from each nation will participate in the opening ceremo ny (subject to the individual nations). A flag and a sign with the name of each country are to be carried on the official entry. Each nation decides for itself, whom they might like to carry their own flag and sign. Below please notice the order of the entry listed with the number of the lane, on which the nation has to take up position (in single file) during the ceremony. First the participant carrying the nations sign enters and right behind the participant carrying the flag enters. During the ceremony a number of speaches will be given by: • The President of the Organizing Committee, Kim Thorsgaard Jensen • The President ofthe Danish Bowling Federation, Arne Hyldekrog • Malene and Morten Christoffersen (players oath) • Mimi Jacobsen (officials oath) • Member ofthe European Zone Presidium, Jacky Felsenstein After the speaches, the Danish National Anthem will be played. 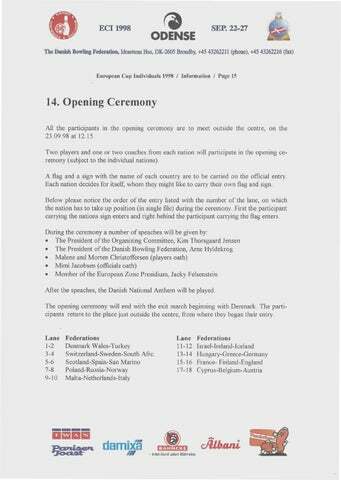 The opening ceremony will end with the exit march beginning with Denmark. The participants return to the place just outside the centre, from where they began their entry.